American football – also known as ‘ gridiron football ‘ for the vertical painted yard lines running across the rectangular pitch – originated in the late 19th century North American colleges, evolving from British rugby sports and soccer association. Early versions of the game were brutal and chaotic, often called ‘mob football’ by contemporaries, with a mix-and-match set of rules, large numbers of players per side and high injury rate. The match generally accepted as the 1st American football game took place in 1869, played between two north-eastern college teams, Princeton and Rutgers (Rutgers took the victory). The game would have been unrecognizable to today’s spectators, as the players were not allowed to pick up the ball. Instead, they advanced towards the scoring zone by kicking or swiping at it with their hands. Variations of the game were adopted by many north-eastern colleges of the era, and an early effort at standardization was made when the 1st Intercollegiate Football Association (IFA) was established in 1873. However, a number of colleges retained their own rules, including Harvard College which preferred its ‘Boston Game’ (a ‘rugby-style’ with a mix of carrying and kicking the ball). 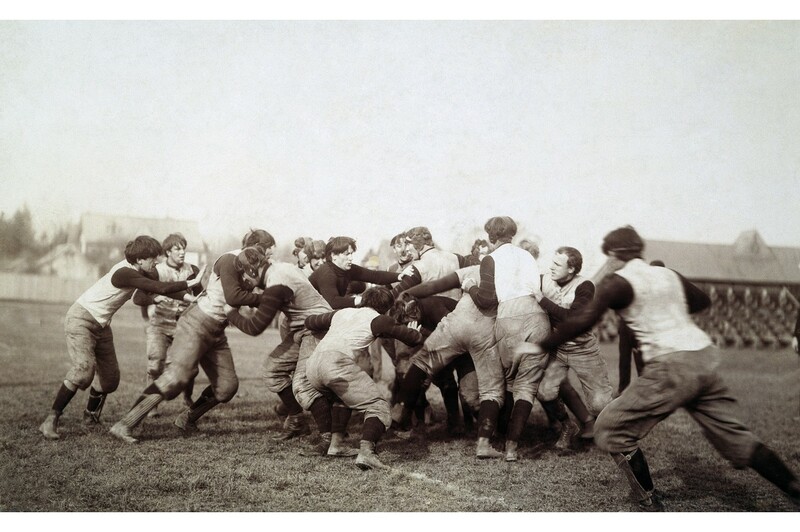 Throughout the late 19th century, intercollegiate matches led to rules and styles being borrowed and swapped between institutions. it wasn’t until the 1880s that the game became more codified, and the man credited with managing the game’s evolution towards its modern form is Walter Camp (1859–1925), often known as the ‘father of American football’. 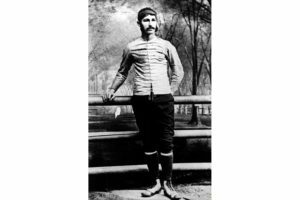 Camp was a Yale undergraduate and medical student between 1876–81, and as well as playing halfback and serving as team captain, he became a key member of the second American Intercollegiate Football Association, which was reformed in 1876 and in existence until 1892. Under Camp’s direction, the IFA established common rules including the system of ‘downs’ (the need for the ball to be moved downfield a certain distance within an allotted number of attempts) and the number of players per side (11). Walter Camp, pictured as an undergraduate at Yale. He is often considered to be the ‘father of American football’. Camp coached the Yale football team from 1888 through 1892, earning a remarkable 67 wins in 69 games – all while working as an executive at a watch-manufacturing firm. And Camp’s fame isn’t restricted to the football world; his athletic prowess and experience also meant he was approached by the US military during the First World War to create a new exercise programme to keep servicemen fit. Camp’s ‘Daily Dozen’, a set of 12 exercises, became an international phenomenon for both men and women and remained hugely popular into the 1920s and 30s. When did American football turn professional? The decades either side of the turn of the century saw the college game grow quickly; several rivalries that were formed in the era still hold today, including the Miami–Cincinnati battle for the Victory Bell trophy (first contested in 1888), and Arkansas–Louisiana battle for the Golden Boot (dating from 1901). A significant milestone for the game came in November 1892, when William ‘Pudge’ Heffelfinger was paid $500 to play a match for the Allegheny Athletic Association (though the payment was not revealed until 80 years later). Although other players may have been paid before this point, the AAA expense sheet is the first evidence of a documented cash payment – often referred to today as ‘ the birth certificate for football ‘ – and marked the first step toward a professional era for the sport. The 1st fully professional game followed in September 1895, when the Pennsylvania-based teams Latrobe Athletic Association and Jeannette Athletic Club met. In 1897, the Latrobe Athletic Association paid all of its players for the whole season, becoming the first fully professional football team. Though there was increased regulation, conditions for the players remained brutal; fractured ribs and limbs, and broken noses were the norms. In 1904 alone, reported the Chicago Tribune, there were 18 football deaths and 159 serious injuries, and a further 19 deaths in the 1905 season. The toll was so significant it attracted the attentions of US President Theodore Roosevelt, who summoned college representatives to the White House in October 1905 and set in motion a period of reform – for instance, matches were shortened and forward passes were made legal. Remarkably, helmets didn’t become mandatory for college football players until 1939, and in the NFL until 1943. 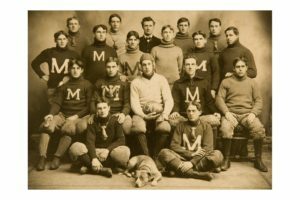 A team portrait of the “M” football team, c1904. In the 1904 season alone, there were 18 football deaths and 159 serious injuries. The early years of the 20th century presented further challenges. During the First World War, there was a dearth of athletic men, which created bidding wars and steeply rising salaries as desirable players were sought across state lines. The need for regulated player transfers led to the creation of the American Profession Football Association in 1920, though it changed its name to one many will recognize, the National Football League (NFL), in 1922. Today, the NFL selection meeting, known as the ‘draft’, is a hugely competitive and anticipated event, a recruitment showcase for the new players available to the league. But it hasn’t always held the same prestige. During the first annual draft of college players, held in 1936, the first player to be selected, Jay Berwanger, chose to pursue a career in rubber and plastics manufacturing instead. Jay Berwanger, halfback of the University of Chicago. After being picked in the first NFL draft, Berwanger chose to pursue a career in plastics manufacturing. When war came to the US once more in 1941, the league faced another struggle to survive. In 1943, Pennsylvania team the Pittsburgh Steelers (named after the city’s dominant steel industry) joined forces with state rivals Philadelphia Eagles (the franchise took its name from the eagle symbol on Roosevelt’s ‘New Deal’ that sought to promote economic recovery after the Great Depression). 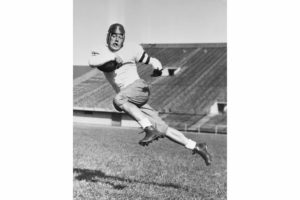 Both had been unable to field a complete team and, for one season, temporarily joined forces as the ‘Phil-Pitt Steagles’.Weathering the conflict, the NFL continued to grow. When a tense and torrid championship game in 1958 between the Baltimore Colts and New York Giants – often called the ‘Greatest Game Ever Played’ – drew 45 million viewers on NBC, it was clear that the sport had firmly captured the attentions of the nation. Now entrenched in American society, and with huge financial potential, in the late 1950s, the NFL was approached by several franchises to expand the league. The AFL opened business in 1960 with eight franchises: Dallas Texans; Houston Oilers; Boston Patriots; Buffalo Bills; New York Titans; Oakland Raiders; Denver Broncos and Los Angeles Chargers. The league conducted its draft separately and began immediately competing on a financial level with the NFL, luring college players with substantially higher salaries. The NFL retained higher support but, as the AFL became more stable, the two leagues’ struggle for supremacy created a ‘civil war’ within the sport. On 8 June 1966, after a series of secret meetings, the rival leagues announced they would merge, and the winners of the two leagues would meet in a championship game at the end of the season, in January 1967. Initially known as the ‘AFL-NFL World Championship’, this annual meeting would become known as the ‘Super Bowl’. The Green Bay Packers are victorious over the Kansas City Chiefs during the first Super Bowl match in January 1967, at the Los Angeles Memorial Coliseum. According to Time Magazine, the names ‘Pro Bowl’ and ‘World Series of Football’ were both considered, before Lamar Hunt, a founder of the AFL and owner of the Kansas City Chiefs, came up with the iconic name ‘Super Bowl’ – reportedly inspired by his son’s ‘Super Ball’ toy. Though an unofficial label during the competition’s first three years, it was finally adopted by the fourth Super Bowl fixture. Another tradition applied retroactively was the use of Roman numerals to count the Super Bowl games, apparently (in the eyes of its founders) giving the fixture more “prestige” and “gravitas”. This also avoided the confusion of using different years for the league and championship game; for instance, the fourth championship game, played in January 1970 after the end 1969 league, became Super Bowl IV. 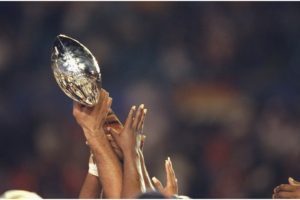 Players for the Denver Bronco players hold up the Lombardi Trophy after winning the Super Bowl XXXIII. 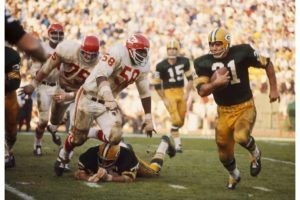 The first Super Bowl was played on 15 January 1967, and saw the Kansas City Chiefs take on the Green Bay Packers at the Los Angeles Memorial Stadium in California – and despite the fixture’s huge popularity today, the first match didn’t even sell out. The Packers earned the win, under their coach Vince Lombardi (1913–70). Famed for his grueling training regimes and high standards, Lombardi had joined the Packers in 1959 after the team’s worst losing season in its history. He went on to coach the team to three successive NFL Championships (between 1965–7) and victories in the first two Super Bowls. To this day, teams in the Super Bowl competing for the Lombardi trophy, renamed after the coach’s death in 1970. 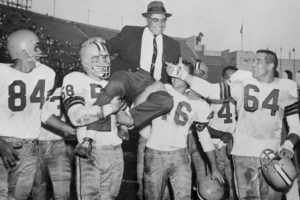 The early success of Lombardi and the Packers did nothing to help the perception that the NFL was still the superior league. Many suggest that it wasn’t until Super Bowl III when the AFL’s New York Jets shocked by taking victory over the NFL’s Baltimore Colts, that the game achieved better parity. There’s certainly no doubting the event’s prestige today; the Super Bowl is the premier sporting fixture of the year in the USA, and many of the matches rank among the most highly watched television events of all time.